On permanent display at the Drake House Museum are three Colonial era rooms--the kitchen, the Queen Anne dining room, and the Washington bedroom. The parlor and the Harberger Library are interpreted as period Victorian rooms. The Museum collection also includes costumes, historical books, photos and prints, paintings, and a wide array of community memorabilia. 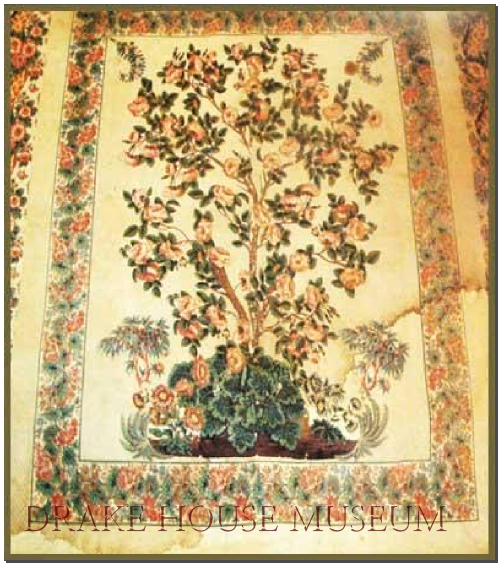 In the Washington Bedroom, visitors may find the most famous of the Drake House quilts, The Tree of Life. This quilt is associated with the daughter of John Hart, representative of the Continental Congress, signer of the Declaration of Independence, and resident of Jersey City. The tree of life pattern is derived from Indian textiles called palampores, indicating that even during America's early history the colonists were influenced by styles from around the world. Although colonial quilts were primarily made to ward off the chill on a cold winter's night, these homespun gems filled several important roles in colonial communities. Among families, many quilts were made as wedding presents for newlyweds. A number of quilts contained family histories, including names, birth, marriage, and death dates. In rural communities, quilting bees provided an outlet for socializing. One quilting bee, which took place in Narragansett, Rhode Island, in 1752 lasted ten days. In the annals of East Jersey history, it is written that Martha Washington took part in quilting bees with the ladies of Morristown while General Washington was stationed at his headquarters, the Ford Mansion. From an aesthetic view, quilting provided an important outlet for artistic creativity. The Historical Society of Plainfield Collection of Quilts is changed regularly in the Washington bedroom. One of the most interesting documents in Drake House is the last will and testament of Isaac Drake, its builder. Upon his death in 1756, Drake manumitted his female slave Cate and provided for the freedom of his three male slaves, Tom, Tone, and Caesar ten years later. This document is important because it records slavery found in the North and among the early families of Plainfield and East Jersey. It also provides evidence of Americans slowly changing their attitudes towards the "peculiar institution," and raises as many questions as answers regarding slavery and the history of colonial African-Americans. Was Isaac Drake influenced by local Quakers in his decision to manumit his slaves? By moral belief or religious persuasion? Why did he set Cate free first and ten years later the male slaves? What happened to Cate, Tom, and Tone after they left Drake House? Why did Cesar, later a free man, continue to reside with the Drake Family? Did Tom, Tone, or Cate take the last name Drake? Cesar served in the Revolutionary War as a freed man, and was a waggoner with Captain William Davision's team brigade, listed as "Caesar an African." In the Harberger Library, visitors are drawn into the heat of a Civil War battle with the huge oil painting "The Death of General Sedgwick" by Civil War veteran Julian Scott, who later became a Plainfield resident. The work recounts the story of Union troops led by General Sedgwick near the courthouse in Spotsylvania, Virginia, in May of 1864. In the depths of sniper fire, it is written that Sedgwick chided his troops by saying "What, What! Men, dodging this way for single bullets? What will you do when they open fire along the whole line? I am ashamed of you. They couldn't hit an elephant at this distance!" No sooner had the general made these remarks than he was critically wounded in a hail of bullets. Scott, who largely painted military subjects, served as a drummer boy and is believed to be the model of the drummer boy looking at the dying officer in the painting. From 1993 to 1994, Scott's work traveled with the Smithsonian exhibition "Picturing History: American Painting 1770-1930". Julian A. Scott, Civil War battle scene painter, was born on February 14, 1846, in Johnson, Vermont. Responding to President Lincoln's call for volunteers; on July 4, 1861, Scott left home and joined the Union Army. Fifteen years old, "under size and under age", he was a musician, or drummer boy, assigned to the staff of the Third Vermont Infantry, where he served for three years in the Virginia Campaign. On April 16, 1862, at the Battle of Lee's Mills, sixteen year old Scott's bravery earned for him the Congressional Medal of Honor. "His company crossing a river was ambushed and driven back with a great loss. Scott, in the face of terrific fire, essayed the rescue of wounded comrades who were drowning, and alone waded the river nine times bringing back helpless soldiers. Scott was badly wounded and in 1863 was honorably discharged from the army at age 17. He took the opportunity of his convalescence to study art at the Academy of Design in New York City. He re-entered the service in 1864 as a volunteer aide on the same staff under whom he had served earlier in Virginia. It was during this second enlistment that he made the sketch of the death of General John Sedgwick on May 9, 1864, at Spotsylvania, Virginia. It was later in 1889 that he painted the large canvas which now hangs in the Drake House Museum. His first studio was in New York City, and it was there that he painted the first Civil War historical painting commissioned by a New England state. In 1870, the Vermont Legislature passed a resolution to approach Scott, "a Vermont-born artist of national reputation" to commemorate the valor of our soldiers. It was decided that the subject should be The Battle of Cedar Creek, fought on October 19, 1864, in the Valley of the Shenandoah, where more Vermont regiments were under fire than in any other battle of the War. One of the two hundred studies Scott prepared is displayed in the Drake House Museum. The original painting, twenty by ten feet, is in the State House in Montpelier Vermont. Scott moved to Plainfield in 1875, at the age of 29, "the most significant artist to reside there in the nineteenth century", and a newspaper account of the day reported that his studio became "a Mecca for the artistically inclined Plainfielders". The bulk of his works are of Civil War scenes, but his paintings occasionally relate to other conflicts, genre, scenes and portraits. At age 55, after a period of declining health, Julian Scott died on July 4, 1901, forty years to the day of his enlistment in the Union Army. He is buried in Hillside Cemetery. He was survived by his wife, Mary Burns, who was the daughter of the founder of the New York Dispatch, and a daughter, Bessie. Visitors to the Drake House Parlor will find a variety of Victorian era treasures, including a horse-hair Empire Style sofa, a 7-legged Creiger piano, crazy quilts, and a stuffed heath hen, which seems to fascinate most young visitors. This land-bound bird was once known as a poor man's dinner. Now extinct, the rarity is largely seen in enclosed glass cases like the one at Drake House and in the pages of natural history books.